March | 2015 | Can Men Cook? Well, we had to try it – it is in walking distance! Tom Kerridge’s new and very different venture. 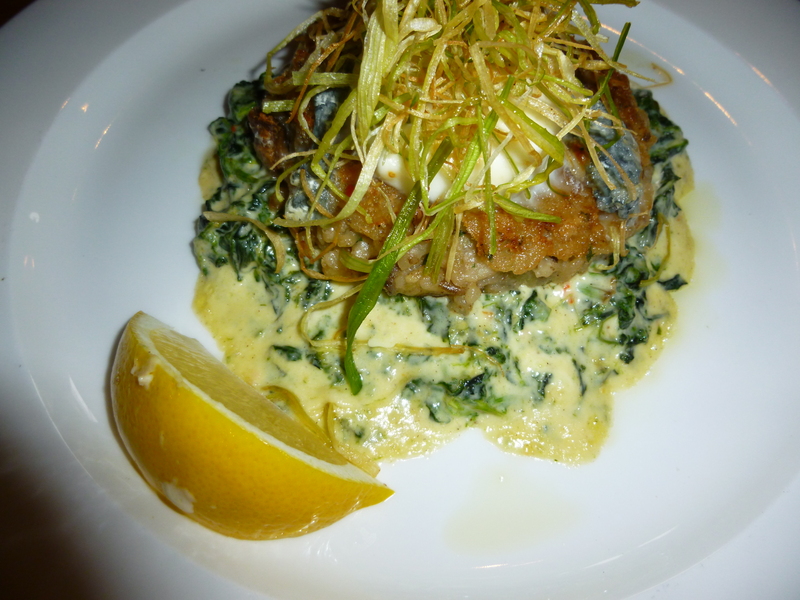 And it is quite excellent and a very different dining experience….read on! So what’s different? It’s a busy, pubby atmosphere, but it feels very welcoming. Staff are attentive – and proud, it seems. You can’t really fake that. No bookings taken – you sort of queue with a drink. The place is tight – almost caravanista in its style of design.. Everything is down to millimetres of space. It is all used well 9as it is in a caravan or house boat) and it actually creates part of the fun of the place. it is crowded, busy, fun, intimate and a recipe for having to chat to the person next to you. 44 covers – and about 1/3rd of those are around the bar. You could easily eat here alone, and not feel alone. We went for the bar stools. And were pleased they were the ones nearest to the open kitchen. You do get to talk to chef (who on the day was the head chef of the establishment). This did make it even more fun, for me. So, food? You can tell which are larger by the price. 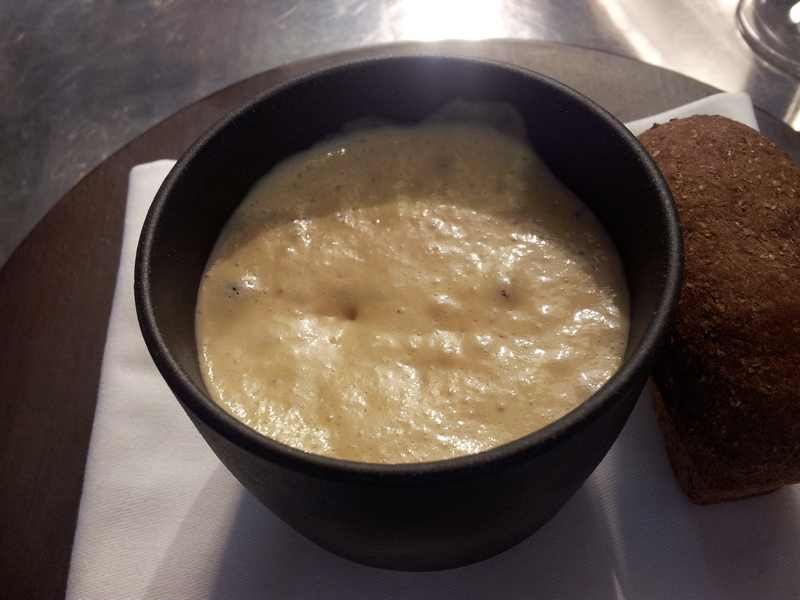 It is sort of big starter with huge depth of ingredient and flavour. Some are bigger than that – but don’t be surpassed if you think “Oh – is that it?” Don’t just eat with your eyes here. Get on with eating. Like my Moule Mariniere were not like any I have ever had. No shells. Finished with Guinness foam. And a tiny, but fully formed treacle bread. It feels small. But it isn’t. The ingredient list is extensive. And that level of chopped shallot carrot and whatever else was lurking in there was at surgical precision level. 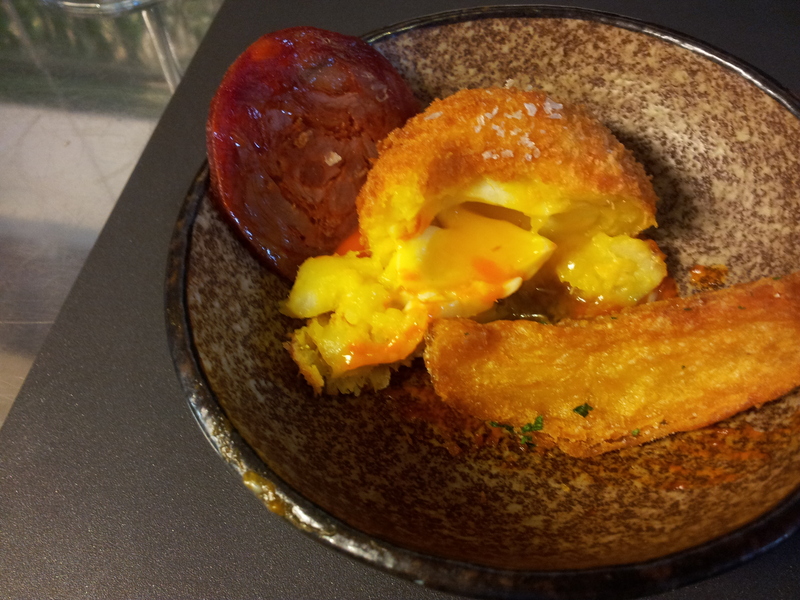 Janie had this amazing Scotch Egg – but had white fish replacing the sausage meat. Gorgeous again, and yet again very satisfying. 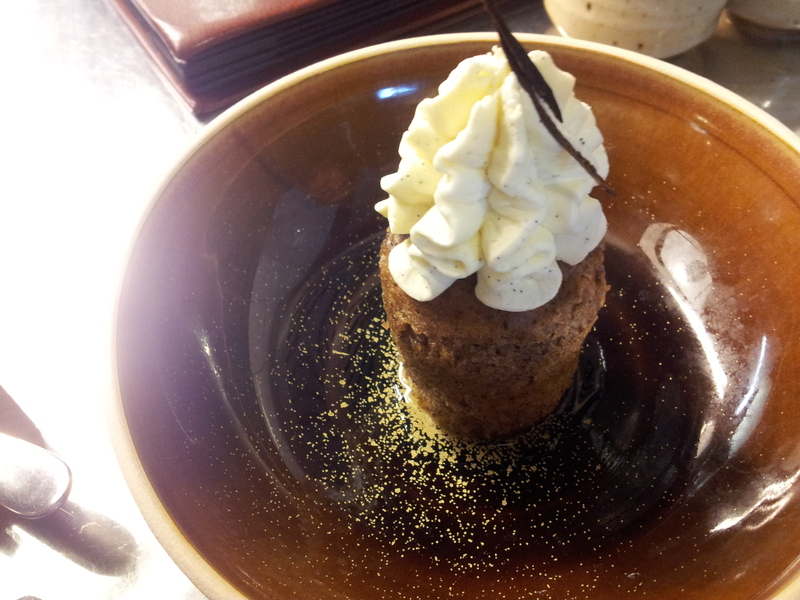 We shared a pudding (Whisky and Rye pudding – a sort of British take on Rum Baba, chef informed us whilst plating up – this is the fun of the place!) and followed with Machiato coffees (which were also fab). Pud – as it should be! It is a fun place. Enjoy the variety of offerings throughout he day – from breakfast to coffee and cake, to lunch and afternoon snacks, then dinner – it is worth the wait. Drinks, coffees and all those bits – just over 40 quid. Didn’t need dinner. And the team are so positive and enthusiastic. Lovely. Indeed. Michelle (and Finley, our Great nephew ) both LOVE (yes, it deserves capitals), gravy. I had made such a vat of it, there was well over a pint still there to use. It had wine, rosemary, the juices from the roasting dish (minus the fat 🙂 – just siphoned out the black gorgeousness with our baster, leaving the fat behind…so what to do? Janie looked up a recipe for French Onion Soup. This involved slow cooking the Kilo of onions (honestly – we only used about a pound and a bit), in olive oil, and a bit of butter. 30 minutes of stirring and henning over it to stop any browning or sticking. Then render it down a bit more with some sugar (two teaspoons, and a tablespoon of sherry or white wine vinegar. 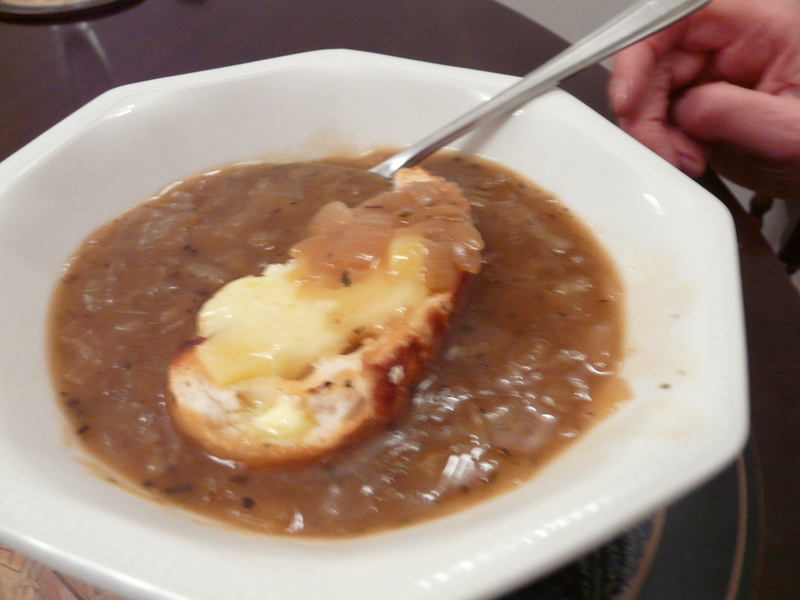 She added a bit of flour, then we poured in the gravy / sauce / stock – which ever you prefer to call it! Then we added some lightly toasted croutons (look – it was a bit of stale tiger bread) with some slices of cheddar and a bit of Parmesan on – microwaved for 30 seconds to melt it (it is Tuesday- can’t be bothered with a Grill tonight). So an excellent meal.. The only new bit was the onion. Everything else was left over from Sunday. Almost free, really. Makes it taste even better! This was just one of those magical lunches. We knew we were eating out – so snack level lunch. Good plan. This is what we got when we ordered Open Crab Sandwich and a portion of chips. Isn’t that just magical? 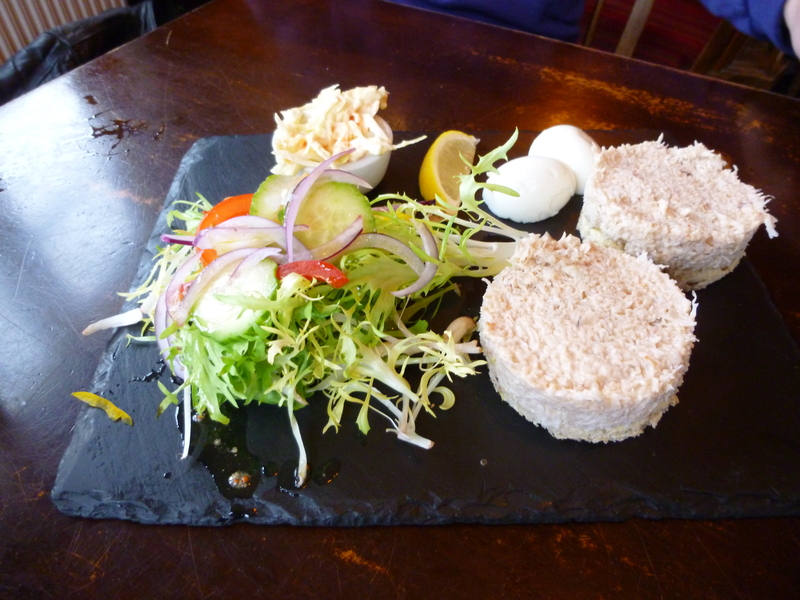 It’s like something from Masterchef – deconstructed crab sandwich – too pretentious for Cornwall! But that’s what it was. There is care, thought and appreciation of the 3 dimensional theatricality beloved of top chefs here – and it was less than 10 quid. The chips were of the usual impeccable standard – there should never be any other standard – but hey, some people cut corners. Not here. Staff were all foodies. “I’ve put on 2 and a half stone since I started here” said our waitress. Worth every pound! OK – mid summer, the atmosphere will be different and there is a strange sort of hell that gets the staff through 400 covers in a session – but they probably make 75% of their money in 3 months of the year? But at this time of year, when you can walk in at 1.00 and get served fairly quickly – and the food is at this level – you’d be daft not to seek it out! I needed to get out and get my head straight – walk to town, haircut, battery in the watch etc. Then, a quick lunch and swift half at my local-est hostelry – The Britannia, Little Marlow Road, Marlow. I’ve written about The Brit before. Steve and Karen have been there a bit over 2 years now, I guess? It really does fill an eclectic market need. More later – but I loved my quick lunch from the new (and quite long) menu. The choice is a varied as the clientele! I had a sort of semi healthy flat bread, filled with slightly spicy and very tasty meatballs in tomato sauce. It was a large portion, made even more substantial with 4 unctuous potato wedges. I ate slowly, having loads of ideas for projects and plans in between bites. The menu as I said varies from big mains like ribs and chicken combos, thorugh bar snack style starters like olives and dipping wings, through healthy grilled skewers. I’m just sad at the demise of Ham Egg and Chips! (One of my fave ways to check a place out…good ham, hand carved, very fresh eggs and chips that are obviously at least twice fried…you know you have good chefs and great suppliers.) Probably I was the only one who ordered it? Two older guys – either widowers or had escaped the shopping – anyway – having a lovely chat and banter with staff, as well as having very naughty knicker-bocker glory style ice cream puds. They wouldn’t have been allowed that f they were with their partners! A IT company team. Overheard one say “But courses are so last century!” – and almost got involved to remonstrate and thought – not worth the effort…maybe I should have? Loads of parents and daughters. Probably many a story to be overheard there – but lovely to see. He had no need to do that. Better in many ways, than a tip. That was so good, I thought. All staff are busy, smiley get on and get on with it – as well as having time to chat. Makes the food taste better, I’m sure, and makes you want to return? Or are you in the second group? The ones who get excited by the challenge of having to pull some eclectic bits together? …read on it needs more explanation! So, I fried the mushrooms slowly. Blasted the spinach in the microwave as suggested. Got the eggs on to poach (slow rolling boil of salted water; transferred to pan via a tea cup – easier to get them not broken yolked, and controlled into the water. 5 minutes from “What shall we have” to “Mmm!” OK – a bit snacky, and would have added some fried potatoes if we had any, but it was lovely, tasty and quick. 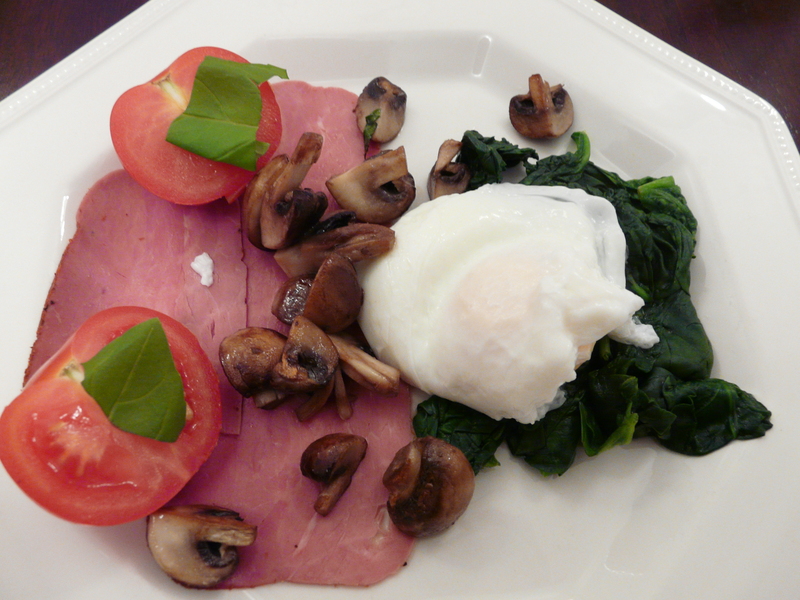 And also, I bet 90% of people would have chucked out the spinach, the pastrami and the mushrooms. I hate waste and checked them suspiciously, and sniffed (I do prefer smell by to sell by…). Can’t go wrong. Oh, the tomatoes had a few ripped bits of Basil from an old basil plant sitting in the kitchen…just loads of tastes. Looks a bit healthy, too? On holidays and other celebrations – always a bit foodie in nature! East Cornwall. Duloe. That’s where we started. And the local pub restaurant is worth writing about. The Plough. New owners in October last year. Tarting it up. Will have letting rooms. And do some very different things. 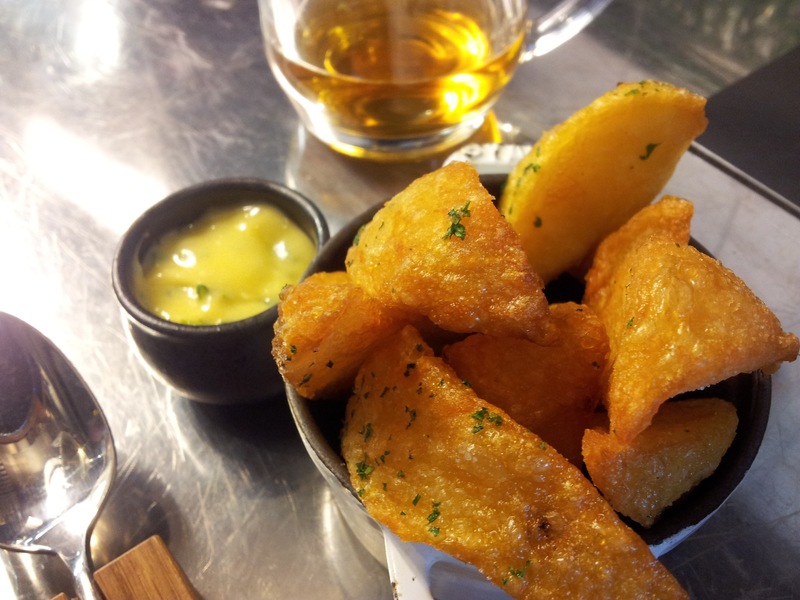 Deep fried battered poached egg as a bar snack? Knocks a scotch egg into touch! But they did those too. And they were a bit different as well. I had something I’d never had before too. I do like game and some of the more Offaly bits – but had never had Oxtail slow braised after pot roasting before. Like some game dishes , and quite a lot of the cheaper and more difficult to source and cook cuts, it was unctuous and strong. Fall apart and really in your face. Some may have found it a bit too strong (was like a beef stew but with the volume turned up…),, but I loved it. It did go very well with the sunny but biting cold wind weather that we had for the week. Also had Mussels and Steak on another night. Mussels were from Devon – and even though they weren’t Cornish, they were just so good! Fantastic dipping sauce always left for the bread dunking – and this was especially herby and lemony. Loved it. On the way to visit our friends in Mawgan (Lizard peninsula – usually on the first page of your road atlas, because any further west and you fall off the edge). We stopped at a lovely little hard to find pub, as there was a road problem. Serious accident sadly. Anyway, it forced us off the road for a few hours, so we were grateful for this stop off. Mussels. I do just love them. And they were pretty damn special here.Jane continued the fish theme with a Crab Bisque – which was more expensive than the mussels (reflecting effort and ingredient costs, I should think). 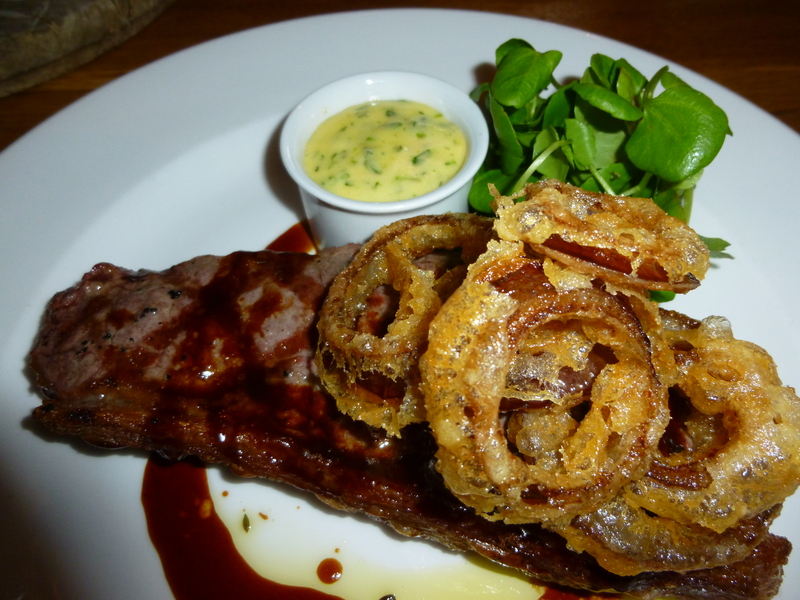 So, before full on Daffodil festival, we had eaten well, but sensibly! 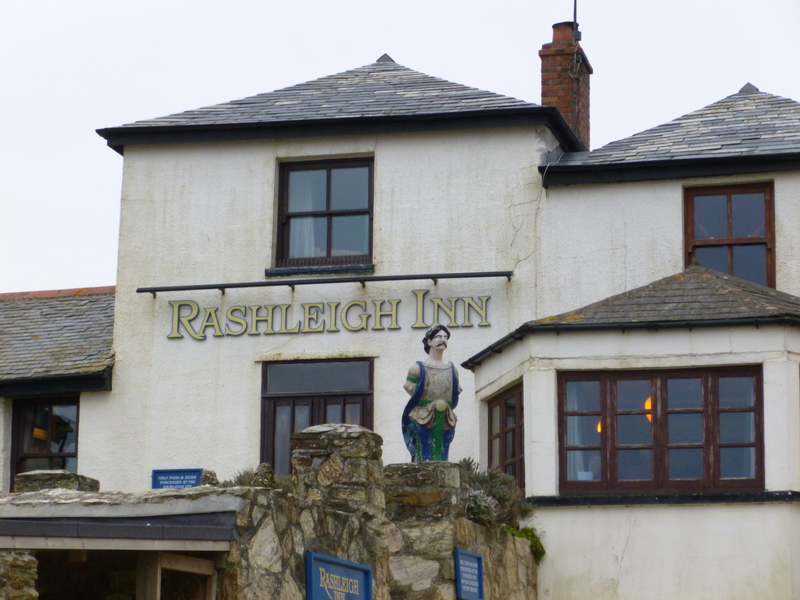 The Ship in Mawgan has been mentioned before on here. That’s because it is an absolute gem. We were helping out a little at a Daffodil Festival, organised and kicked into active life by our friend, Wendy. We needed sustenance. Night one – take away fish and chips from the pub. Look, this is not the cheap and cheerful meal it was when I used to have it as a youngster. But this was fine dining from a box of stunningly cooked and patently well sourced ingredients . 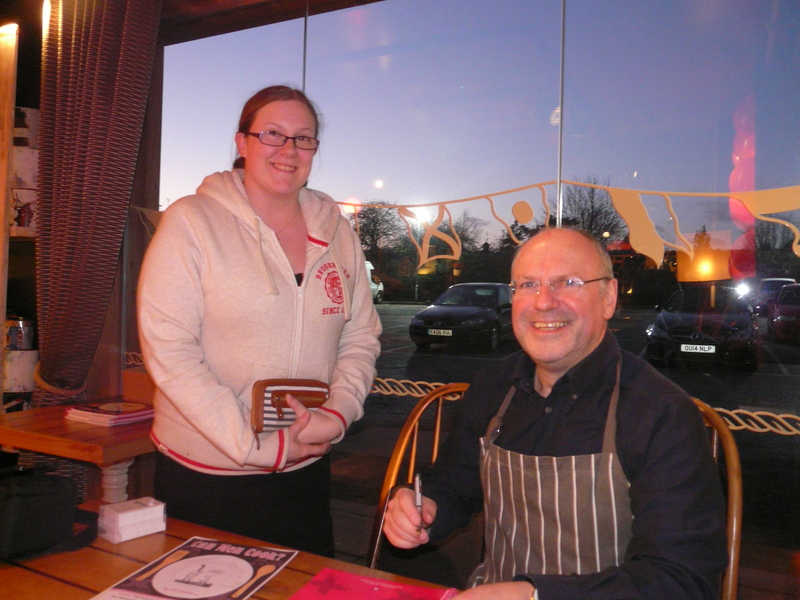 On the Saturday – Valentines evening – we ate as a table of 4. There were only 3 actual couples in the whole place. So, what did we have? Wendy had the blissfully enticing Crab Bisque – very intense flavours. And here’s two more of them! Just lovely scrummy risotto and quite meltingly blissful steaks…however good the chef, it’s worthless unless you go for the best ingredients. The Ship manages both rather well. Finally, must mention our last meal on the run. We went for take out pizzas from Treloworan, cooked in a proper wood burning pizza oven. They were very special indeed. If you are on hols nearby, well worth seeking out. It just feels so much more authentic than doing a standard take away one, or a cook it yourself. 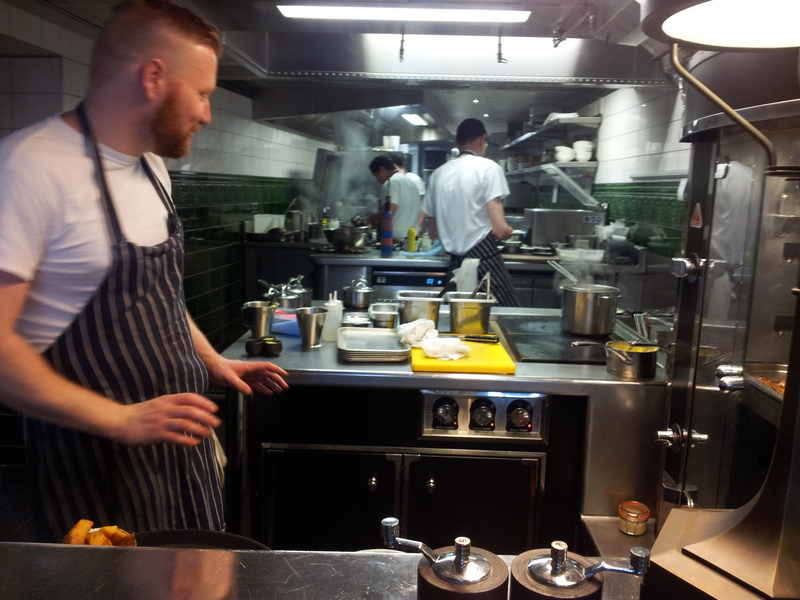 Chef – very young, early 20s? – was totally enthusiastic about the oven and his hand thrown pizzas. You can’t fake enthusiasm, can you? They were a fine end to a great gastronomic holiday.